Me: यह क्या बवाल है, जब मेरे को करना होता है तभी नेट का बवाल होता है . schedule में भूल ही गया था . Hearing this I was almost ROFL...in reality. This is what happens in any Indi meet. Again it was Oberoi, the same place as the DID meet in November. Last time it was dance and this time I was happy that it was no such thing. After a day at the office it was a relaxed meet. This was about technology. On the day of the meet I got down at JLN metro station at 5 p.m. and decided to walk as I had a full hour. Switched on Google Navigation, GPS and set off to the place. The world looks different when you are walking, watching the trees, even talking to them, watching and trying to catch the squirrels on the way. Finally after a pure leisure walk, much slower than a tortoise, reached the venue after 45 mins. Later on in the lobby it was hi hello to the old pals and I waited for the others to also turn up. Sheetal , Dipali, Shaivi, Gautam, Yogesh, Subir etc. were all there. At 6.30 there was a line to go into the ballroom but only 5 people were being allowed in one go.. मंदिर के दर्शन हैं क्या ? एक बार में सिर्फ 5? 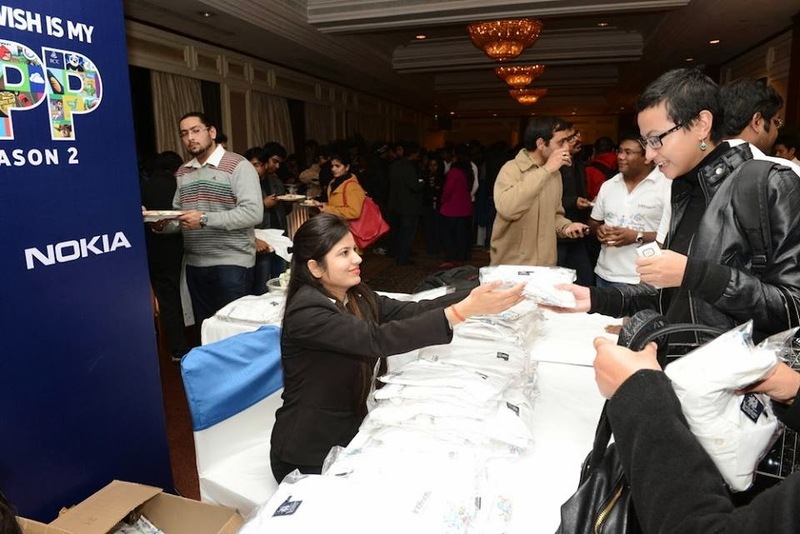 I was probably 2nd in the line when Vineet opened the door and said, “ Sorry guys we have only 5 laptops thats why...”. He then looked at me and said, “ Hi Zombie ” and an instant alarm goes in my mind , “ He cant be serious yaar. That zombie performance was way back...in August 2013 in the Ambipur meet. They remember it till now? 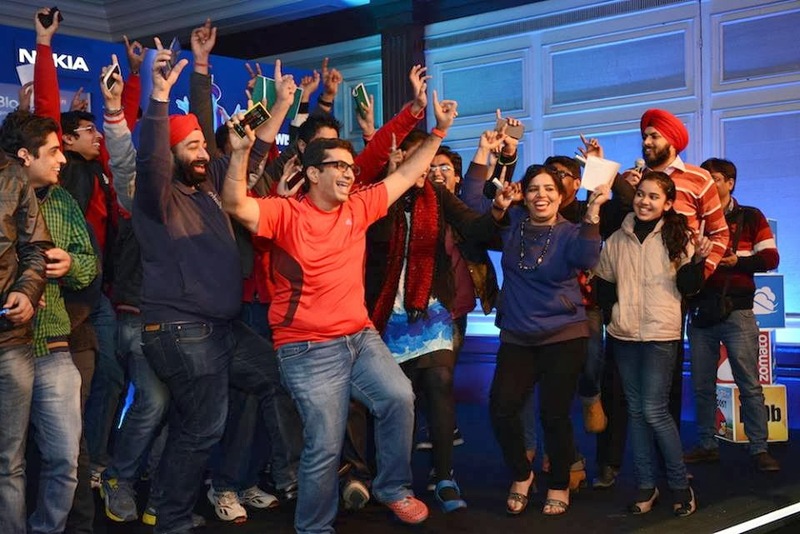 I am just one person in the 100s of bloggers in the Delhi/NCR circuit ”. Then I remember 2-3 people who made this tag stick to me- Arvind Passey, Aditya Bhasin, Jatin and the whole lot of Indibloggers present in that meet. After the registration moved to have a cup of coffee so that the weariness of the day wears off quickly. Inside it was all different. The blue background and the Illuminating light proving to be soothing to the eyes. The main event started with Anoop starting with the mike and I was thinking that the anchors for today were supposed to be those 3. What is he doing here? It was time to warm up with the familiar Hurr Hurr.. Make some noise. So the time to welcome the guests or should i say the prank..Anoop introduced the names of the guests and each time a guy with a mask appeared on stage. Nice way to lighten up the mood. Finally it was time to welcome the celebs - in reality. Ms. Poonam from Nokia. A presentation was given by a senior level executive from Nokia, the apps, apps in development and all such stuff. For the first time I was listening to something with such rapt attention otherwise the sponsor talk bores me everytime. 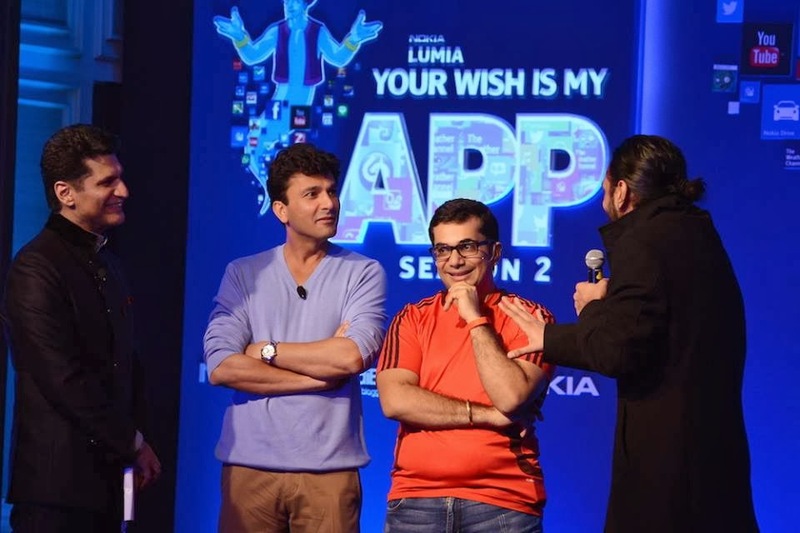 It also gave me an idea about what really is Your Wish My App all about? So there were apps for everything with Nokia – Food, Calories count, Security, Mobile Networks and so much. We desire and it gets developed. After a huge round of applause it was time for the 3 to take centre stage amidst a huge round of applause and cheering. Rajiv Makhni became the anchor now. Looked like he was hosting another episode of NDTV Gadgets. We saw the video about Season 1 of YWMA. So many brilliant ideas, so many apps. Last season the idea to shortlist just 3 was scrapped to include thousands now. 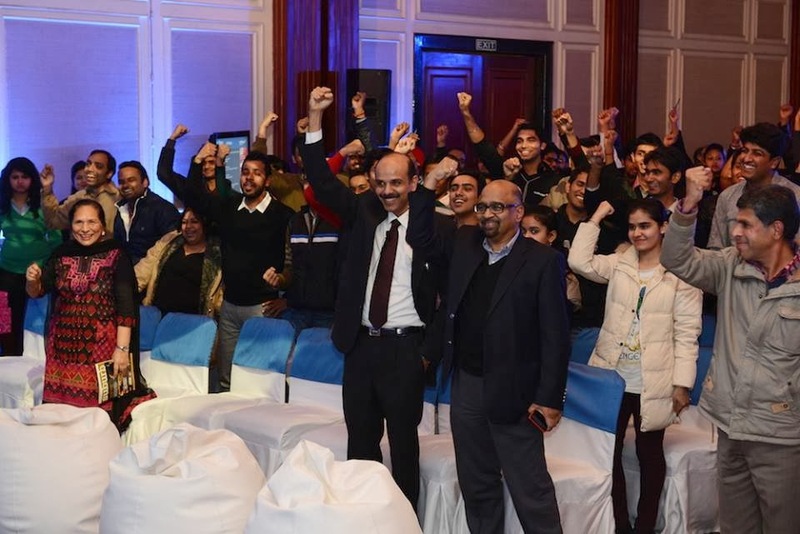 Starting from India, this initiative now launches in 7 more countries and Delhi is the first city in season 2 alongwith the coverage by NDTV.. Yeah !!!! 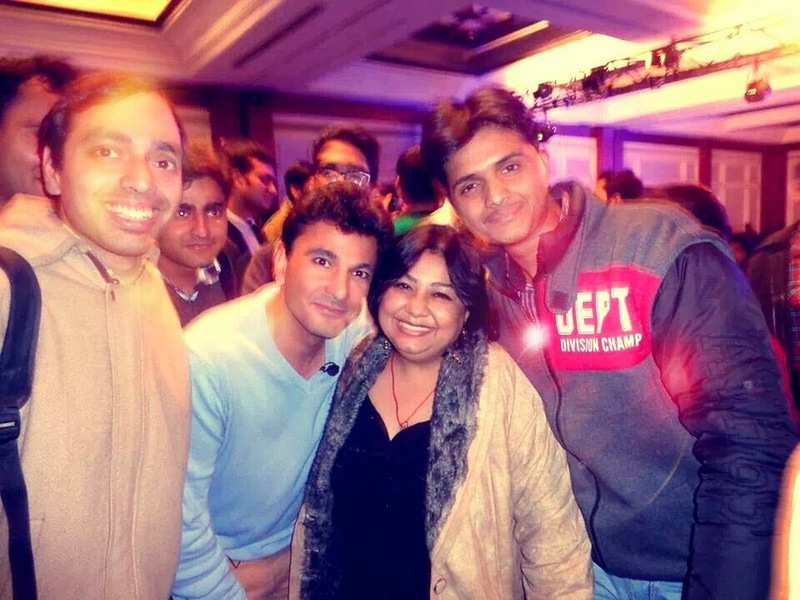 Vikas Khanna was all about food and humour, Vishal Gondal all the tech person and Rajiv Makhni the mix of both. The person with the winning app in this meet goes into the final 30. 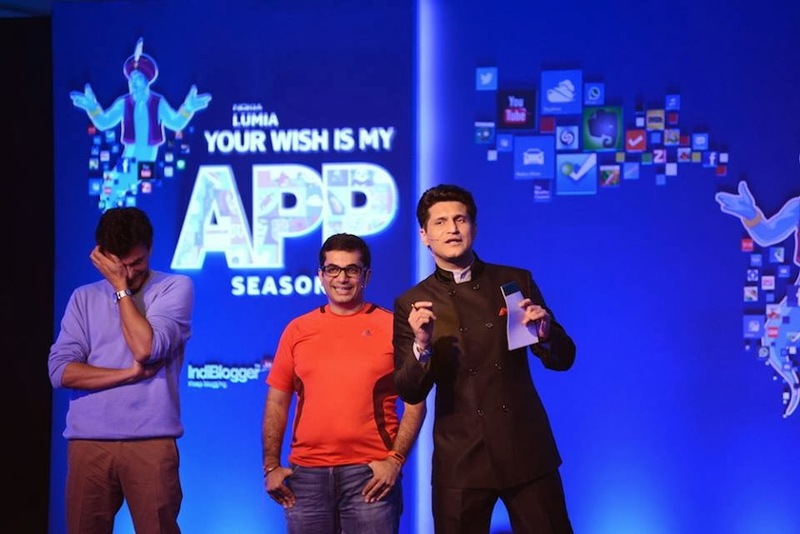 They had us roaring with laughter when they described how Vikas grilled people on their app ideas about food. The manner in which they described, had to be seen to be believed. Tweets were flying thick and fast on the board. It was decided that the next 5 tweets to be displayed on the board after one particular name would be given prizes. Damn...my phone had to go into low memory just then. The tweet just didnt go and I lost.. Grr. जब काम होता है तो कुछ भी नहीं चलता है .Simardeep got a prize although. 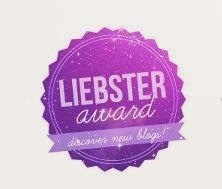 Next came up the “ Sabse chota and bada blogger” alongwith the idea of persons coming from the farthest places. Vikas immediately spoke up, “ New York”. Na na... your are the judge, this wont count. So we had 3 people with an idea each- an 8 year old girl, a boy and girl from a family which had come from the farthest place and a lady who was the oldest, I think in the 50+ age group. First time I heard some lady disclosing her age. Why wont she , there were prizes at stake. 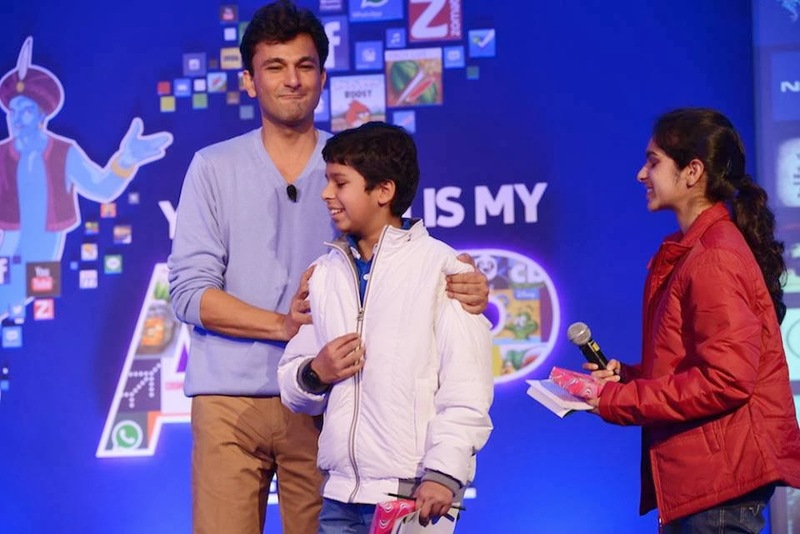 The kid got grilled in his app idea by Vikas. Gulab Jamun in 3 D- feel it, same smell, taste,aroma and yet you cant eat it. The only question which Vikas aksed, “ बेटा घर पे तेरे को गुलाब जामुन नहीं मिलते खाने को ?”. Laughter and smiles all around. Both Vikas and Vishal were keeping it light and peppy. It was time for some magic so `Karan` came up (guess thats what his name was). The old trick of cards- pull out a card and I’ll tell you which one it is by analysing whether you are telling the truth or lies. This round surely went to Vishal. He was thoroughly confused what was happening and he himself disclosed the card once. Game started again and they all did their jobs. 1. The ladies/girls can use it to win the hearts of family, husband, boyfriend, crush. 2. Husbands- the perfect app for manaoing the upset wife and display the culinary skills. 3. The bachelors- No need to mention. Everyone knows it. The whole point of this judging was to give an idea of how tough it is to judge and all that which goes behind accepting and rejecting ideas. The audience also got a chance. From the lot of ideas we had submitted, few got picked out. A loo locator for the ladies and a PHD matter helper. The former won. An app which works as a calender/reminder about the various festivals and all the info regarding that- tradition, food etc. A few more came up on security, food as such. Prizes up for grabs for tweeting now. One question each. Vikas goes first. “Amul butter....” tweets start flowing even before its completed.. “ Butter” comes the response. Then he completes “ What thing gives it the yellow colour it has?”. Answers range from salt, preservatives to even Haldi. The answer was Annato. Gautam googles it and wins the prize for using “Google the fastest”. The 2nd question comes from Vishal, “What is a Nibble?”. 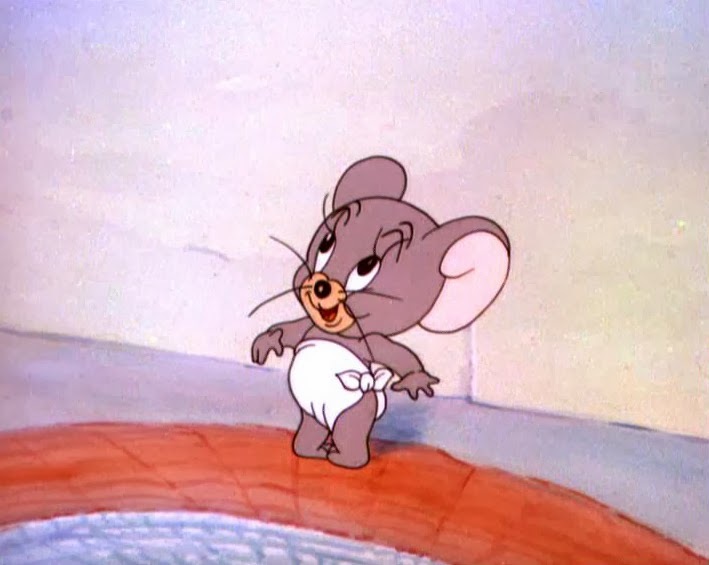 He is a techno guy but my mind wanders to this cute Nibble from Tom and Jerry. Now how could I tweet a pic of her? Someone prompted me the answer - 4 bits. I tweeted and it never showed up. My every tweet about the event was showing up but not the ones in response to the questions. Is there any jammer for tweets? Now it was team activity. Vikas,Vishal both were asked to select 5 people as a team and present an app idea in 60 seconds. This is what happened in reality- people were so charged up that everyone started coming up and now there were some 20-30 people in each team. Vishal picked up people wearing red. Sweaters, turbans, even ladies donning red lipstick came. The team idea- an app which can let everyone dance in a synchronized fashion in a team, even those who dont know how to dance. 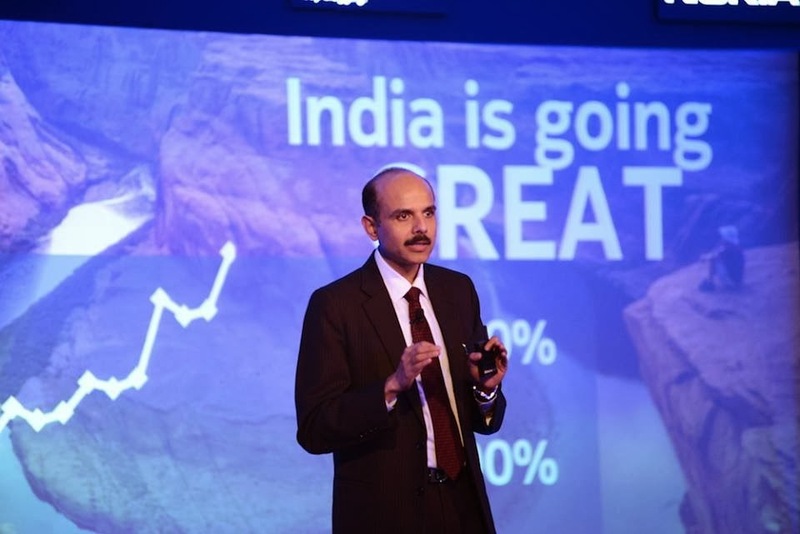 Why should Nokia be left behind? 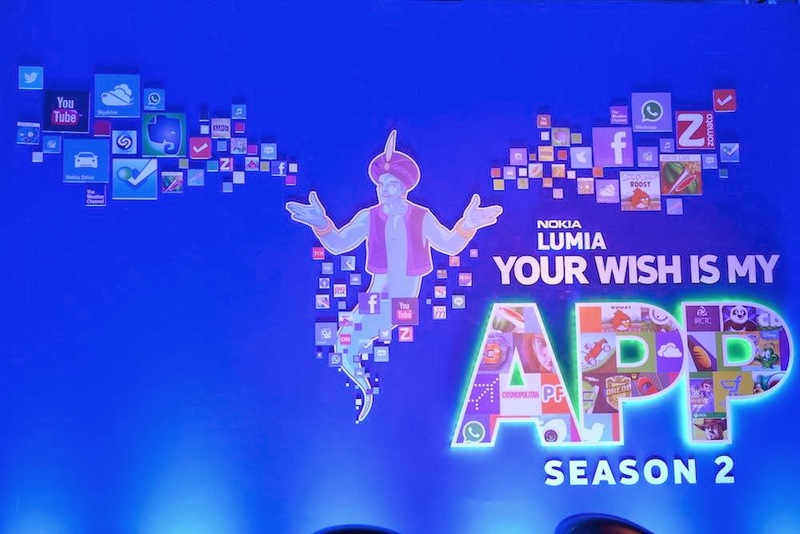 Ms Poonam was invited to hear ideas about the apps and thats when all hell broke loose. Everyone was rushing for the mike,telling the ideas. I lost track of all that. A few lucky ones got to say their ideas at the end. The group photo and the individual ones followed. From the bottom of my heart I say this- I havent seen more humble, down to earth people than these 3. Virtually mobbed, they were damn patient to have pics clicked with each and every one. Every request for a pic- GRANTED. 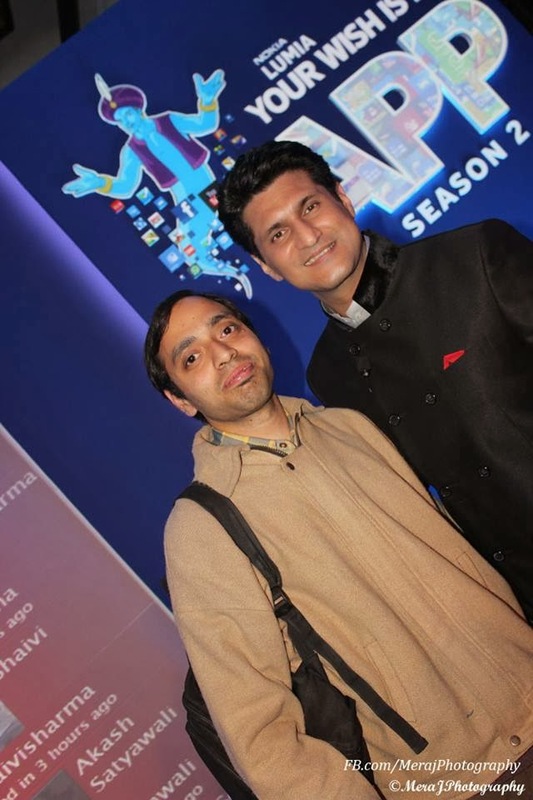 I had conveyed my desire to have my pic clicked with Rajiv makhni to my friend Meraj. Didnt see him all this while and suddenly he comes up behind me saying, “Shwetabh jaa na ...photo”. I was overjoyed (which would triple in a few mins.) . Him: Sure...tell me where I am looking at ? (With so many cameras around him, he had to know where to focus). I just pointed to where Meraj was with the camera and the rest is captured in pics for the lifetime. Me with Rajiv Makhni. The joy reflected on my face. Next it was time for the chef Vikas Khanna. This time I was not alone as we- Gautam, Me, Dipali, Rahul surrounded him for a group pic. Double elated. He even held Dipali ji`s hand and escorted her out. Wow. People left for mission dinner and I left for something more important. 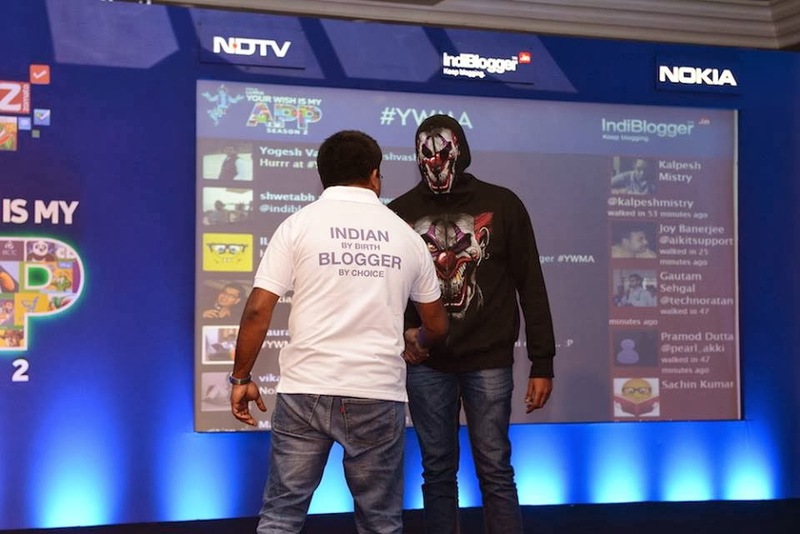 Went up to the Indiblogger team and inquiried about the person handling the twitter account. Over the next 15 mins. I told them my idea of help I wanted. Wanted my poem on the Param Veer Chakra winners to be shared on twitter on 26th Jan. Everyone agreed in the first instance in a cause which was beyond blogging. Also carried a few comics to show it to them and there was a sparkle in the eyes of all- Nihal, Anoop, Vineet, Karthik when they saw it. I was promised and I held on it. I was so, so, so happy that all hunger died. It was chaos later on as the T shirts had finished. Few printed and too many people. The ones left without the shirts surrounded the team. I was one of them. We were promised that we`ll get it later on. The meet ended with so much- so many people, so many tweets, so much happiness with the celebs. I fall short of words when it comes to describe them. Only the ones there that day would be able to feel and experience what I am trying to say.An overwhelming experience. 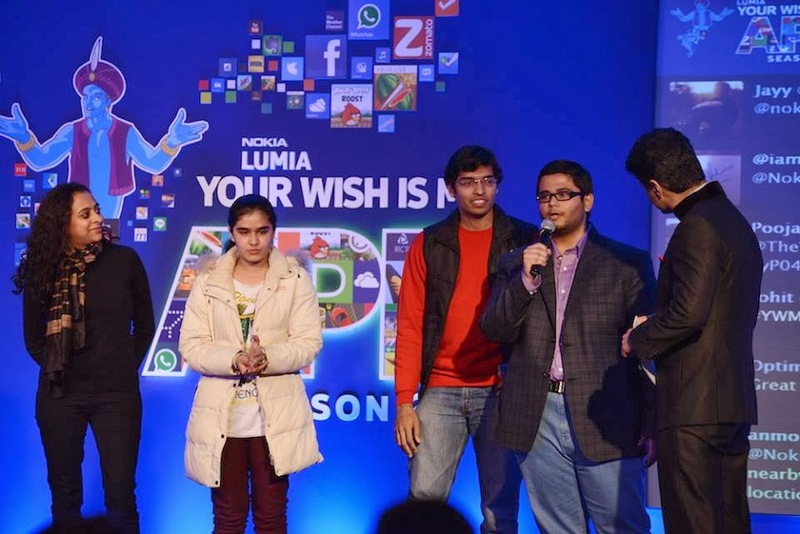 By the way Simardeep didn’t get the nokia lumia, it was a usb mobile charger. Vikas, that sign language idea was awesome. Someone should REALLY go ahead and put an effort in developing that app. Indiblogger really did keep that promise. They Rted the poem link on the 26th. How about keeping these 3 on the anchoring panel of Indiblogger? Its called MEDIC. I have seen many people unable to buy expensive medicines which the doctors prescribe for treatments. For some serious illness they are forced to buy those medicines and continue the treatment which ultimately takes a hit on their pockets. MEDIC would enable people to know the cheaper medicine which they can buy based on the salt content of any particular medicine. It would also enable the search for various substitute medicines. For e.g. If a person enters the name as Crocin, it would display the various salt composition in % in Crocin and then suggest the names of the various medicines having the same composition as Crocin. There are many companies available in the market which manufacture various drugs and medicines just like the big and well known brands at much more cheaper rates. Its just that we don’t know about that. 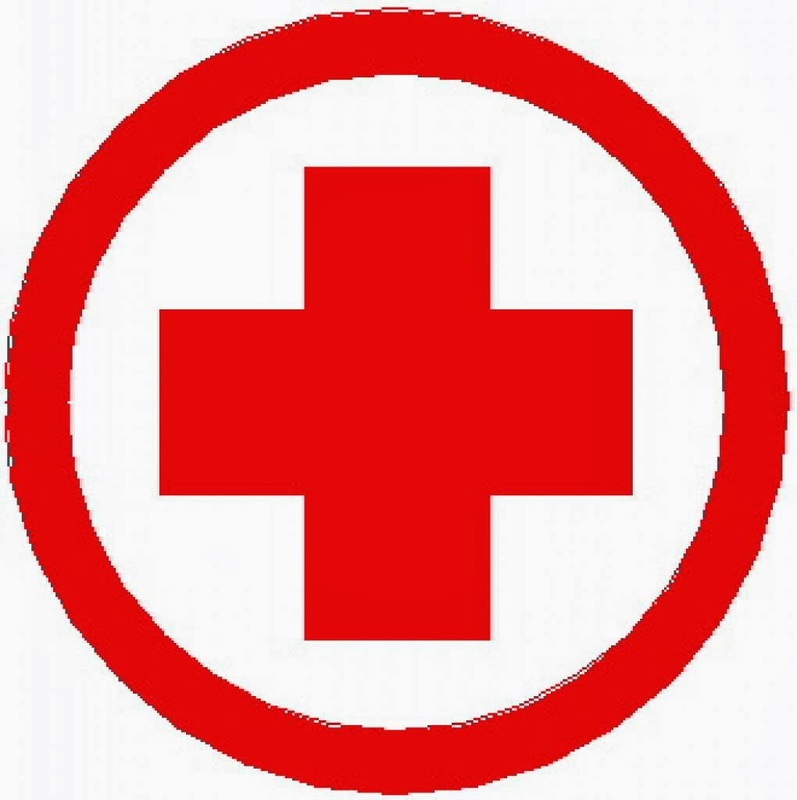 I do hope that if MEDIC is developed, it can help people in getting affordable healthcare to quite an extent. This is my wish for an app. #YWMA. A rather long post... but one of the few I read from the start till the end. maybe because I wasn't there at the meet and was just curious to know how everything went. I guess you guys enjoyed... which is a great thing.